I don’t ride every day. I wish I could. In fact if I get on a horse once a week I’m doing well. Well, that is not entirely true either. I actually ride every day. In fact I probably spend most of my day on a horse. Does this sound like a paradox? Well, everything I do in my life I relate to riding. Whether that is driving my car, walking down the street, or modeling for my students. You see, I am a Centered Riding Instructor by profession. I have to admit it is a pretty good job. I work for myself, for the past 10 years in fact. I really like being my own boss although anyone who is self-employed knows that you miss getting paid vacation time and bonuses at Christmas. I get to travel all around the world and teach people how to communicate better with their horses and make riding more of a joy in their life. Me, I ride lots of airplanes, highways, back roads and computers organizing and traveling to clinics. Everyone thinks I have the life. Traveling to places like New Zealand every winter. Next year I will even be taking people on a Centered Riding Safari in Africa.Well, I have half a life. The other half suffers silently waiting her turn’ the opportunity to have my own horse and spend part of every day in a relationship with a hairy-thousand pound beast that drools at the sight of a carrot coming towards it. Sometimes you wonder how that can be enough – a simple scratch on the withers or a few ear strokes and these enormous creatures want to fall into your lap. (I don’t notice it much, but lately people keep telling me how much their animals like me. Dogs that always come into the arena to say Hi! When I am around; cats that appear when typically they go into hiding when strangers arrive, and horses that all seem to want to come home with me at the end of a clinic.) Anyway, I keep wondering how long I can continue to teach everyone else when I don’t have a horse of my own. It seems it has been like this for a long time. I haven’t actually owned a horse since 1987. I have had a couple of horses to ride for about 6 months at a time, but they were other people’s horses that needed lots of help or were lame. So that sweet relationship has eluded me for the majority of my life. I have had a horse for a total of 4 years out the past 40. Humm…… I have to wonder sometimes.Actually, traveling and doing clinics does provide me with endorphins. It is very rewarding to watch the horses begin to breathe as the rider does, and lower their head six inches when I release someone’s hip joint, and raise their back as the rider releases in the pelvis. I think the horses know that somehow I have made their life better by showing their riders how to breathe and soften in their hip joints and in general be more comfortable on their backs. It is also a rush to see the light go on in a student’s eyes when they feel the horse soften underneath them and quietly go on the bit. This is so rewarding that I continue to travel crazily around the countryside teaching Centered Riding. But deep inside I keep hearing this little voice “what about me? !”So I practice my riding in everything I do. This way at least when I do finally get a horse, I am able to ride. In fact, just the other day I was doing a clinic for a public stable and I realized that most of the riders in the clinic did not own their own horse and probably only rode once or twice a week. One of them asked me whether the school horse would remember this stuff even though it was ridden by other people the rest of the week. I replied that it would as long as the student remembered to converse using her newfound techniques.This question got me to thinking about my own sporadic riding. I realized that while I probably ride as infrequently as these people do, my riding has improved far beyond the typical expectations of the “once-a-weekers” I was teaching. In fact, just a few weeks before I had to help a student with her canter pirouettes. Now it is not like I get to practice canter pirouettes on horseback every day (I have done thousands on a mini-trampoline over the years). Yet I was able to perform them on this horse and improve his overall performance. “Why?” I asked myself. The answer was pretty clear: because I keep practicing all the movements over and over again in my head and on the ground. And I practice them perfectly, seeing the horse lightly move away from my aids, happy in his work, me sitting perfectly and smiling the whole time. And I understand the foundation of good movement in both horse and rider. If the foundation is sound, then performing the more advanced movements becomes easy. So this leads me to my students again. I realized that if I can do it, so can they. It is not that I am a particularly talented rider; I was certainly not a natural like some folks and I have had a major injury that got me into all the TT.E.A.M. and Centered Riding in the first place. I broke my hip socket when a horse flipped over on me. Believe me, that has a very limiting effect on one’s riding. Yet through the past 13 years since my accident, I have made major progress without the benefit of owning a horse (or therapeutic riding which might have been a good thing). Physical therapy did not exist for riders back then and I am envious of friends that have had pelvic injuries now when I hear about the wonderful physical rehabilitation they have received. I had to do it on my own. Enough whining. So I have realized once again the power of practicing without actually riding. I talk about it all the time in my clinics. I explain about the study with the basketball team that improved their free throws without actually shooting a basket or the guy in Vietnam that took several strokes off his golf game and kept himself from going crazy by playing 18 holes of golf while being trapped in a little box for weeks. I also talk about practicing Centered Riding in everything you do from driving the car to washing dishes or dealing with your children. I guess in this case I practice what I preach AND I benefit from the results. That does not mean that I get it right all the time. When I made the mistake of coming home from a clinic on Memorial Day Monday at 7:00 pm on the New Jersey Turnpike, I can honestly state that I was far from “centered”. In fact if any of you were at the toll booth at about 10:00 pm that night (at the New York City end) you may have noticed a completely crazed woman in a blue Acura Integra about to jump out of her car and pound on the hood of some cars on her left trying to cut in front of her. You could at least hear her yelling at the drivers and threatening to ram them. Yes, I must admit it was I. Notice when you are breathing well, that the diaphragm supports the ribcage from below and the ribs expand outward. Practice walking this type of diaphragm support. You could imagine that you had a tray in your hand. Observe how the torso muscles need to come into use in order to keep the tray level (this will also help tone the internal muscles in your pelvis). Make sure you practice carrying a tray in either hand so that you are balanced on both sides of your body. For that matter, practice mucking your stall the non-habitual way or the opposite way you usually do. You might find that you get frustrated very quickly and want to switch because you are taking so long. Remember that you need to develop both sides of your body if you want the horse to respond equally on both reins. Other things you can do are the Alexander technique, Feldenkrais and other forms of body awareness exercises such as T’ai Chi. Or take up ballroom dancing. I did for several years and it really straightened out an issue I had about rolling to the outside of my right foot and supporting my weight on my left leg. And it was really fun! A friend of mine, Joyce Harman DVM, has spent less time on a horse than I have lately. I recently gave her a lesson and she has improved tremendously since the last lesson, two years ago, because she has been going to a network chiropractor and walking up a steep hill every day after she feeds her horses. One last suggestion I would like to make is meditation. Now I know this sounds a little bit “eastern” but let me explain. I have been meditating for 12 years and I have experienced profound changes in my body as a result. So if you can’t connect to the concept for its “peace and calmness” think of it as a great way to improve your seat for riding. Here’s how. The position of sitting with the spine aligned and legs crossed (lotus position is definitely not necessary) helps strengthen the torso perfectly for riding. At first I used to need a wall to rest against and pillows behind my back. Now I can sit for an hour without any assistance because I have sufficiently strengthened the muscles in my abdomen and back while releasing the tension around my hip joints. 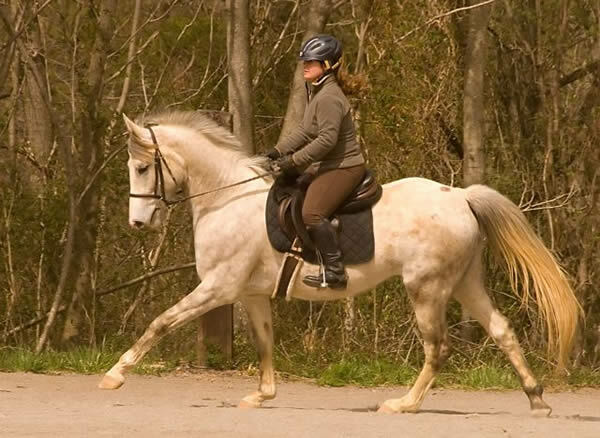 The result of this release is greater freedom of movement in my hips so that I can sit the trot more fluidly. Before you know it you will be cantering to the bus waiting for the kids and practicing your side pass heading out to the garbage can, tucking your seat for the perfect slide stop into the traffic light or gently half-halting as you apply the brakes coming into a curve in the road. You will notice that your breathe when you get another one of those harassing solicitation phone calls instead of slamming the phone on the guy’s ear. Perhaps you will find yourself centering as you wait in line at the grocery store instead of wanting to knock everyone down to get to the checkout. Remember, the more se nses you involve, smell, hearing, etc. the more powerful visualizations become. Now if I can just figure out how to visualize melting off 20 lbs. as I travel…… ah well, I guess that comes with practice. Copyright© 2000. All rights reserved.